This sculpture was created during a Toyota TogetherGreen fellowship through the National Audubon Society in 2013. The project entailed creating a new piece based on an energy conservation educational program for 6th grade students at Ortiz Middle School in Santa Fe, NM. Part 1. An energy curriculum was presented for 3 weeks to 6th graders in Ms. Sommer’s Science Class. The curriculum included how energy is created; the pros and cons of different energy sources; and how to conserve it. Homework assignments were to implement energy conservation actions in their homes using kits donated to each student by PNM. Part 2. 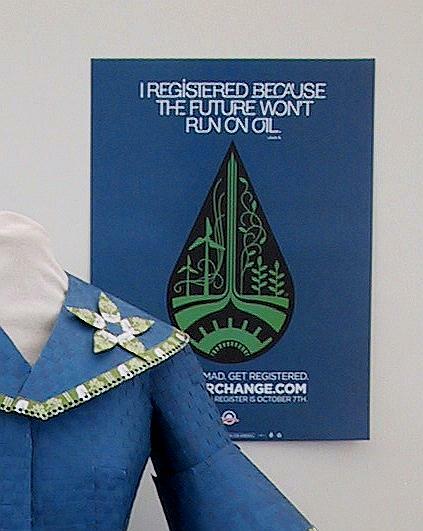 Nancy worked with the 6th Grade Art Class to design an “energy conservation” superhero costume. Part 3. The Consumer Sciences Class helped her to construct the cape for the costume. It is made from energy conservation scrap materials from the Energy Smart Academy at the Community College. It sits on a pedestal that is an old solar cell. Part 4. The completed costume was displayed in prominent public locations around Santa Fe and Albuquerque and is on permanent display at the College of Santa Fe in New Mexico. Thank you to the following collaborators that made this project possible! Toyota funded the fellowship that I received. The National Audubon Society administered the fellowship. The Santa Fe Public Schools (Lisa Randal, Ellen Levy, Amy Summa) provided project coordination. Erika Sommer, Ed Chacon and Myoko Costello graciously invited me into their classrooms. PNM (Melissa Leymon) donated the curriculum and energy efficiency kits and helped with planning. The Santa Fe Community College’s New Mexico Energy$mart Academy (Amanda Evans) supplied educational materials to the science class as well as materials to create the Sol Man. The City of Santa Fe, Sustainable Santa Fe program (Katherine Mortimer) provided project support. Summit Electric Supply (Mike Prada) donated 100 CFL bulbs. Santa Fe Place Mall (Lance Farrell) donated space to display the Sol Man for 2 months and event planning and refreshments for the opening reception. Target supplied refreshments for the opening reception. KHFM (Kathleen King and Dana Childs) Radio Station advertised the event and did several interviews. Santa Fe New Mexican (Robert Knott and Jane Roberts) wrote about and photographed the classroom portion of the project. Santa Fe Reporter (Enrique Limón) wrote about and photographed the Sol Man. Dan Radven welded the legs, arms, armature and base. Nicole Morris assured the musculature was correct. Elizabeth Baker captured the project on film. Positive Energy (Regina Wheeler, Allan Sindelar) supplied the old solar cell that is the base for the sculpture. Carl Rosenthal provided many materials used to make the Sol Man. Jim and Marj Mullany provided window insulation used to create his suit. Los Alamos National Bank (Kate Kennedy) is helping to fund displaying of the Sol Man over the next year. Earth Care International (BJ Davis, Rose Griego) is my non-profit fiscal sponsor accepting funds for the display of the Sol Man.